I’m sure everyone’s been getting blasted with pumpkin this and pumpkin that recipes lately; it’s just the nature of the season and I’m totally for it! I’m not the biggest fan of “pumpkin-spice”, but pumpkin itself, I can 100% get behind. 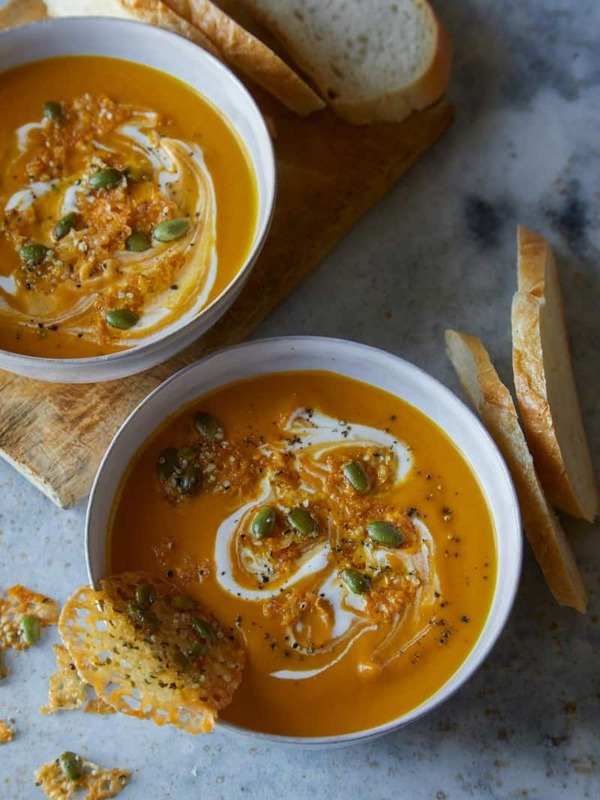 Today’s recipe is a very simple Creamy Pumpkin Soup Topped with Parmesan Crisps. 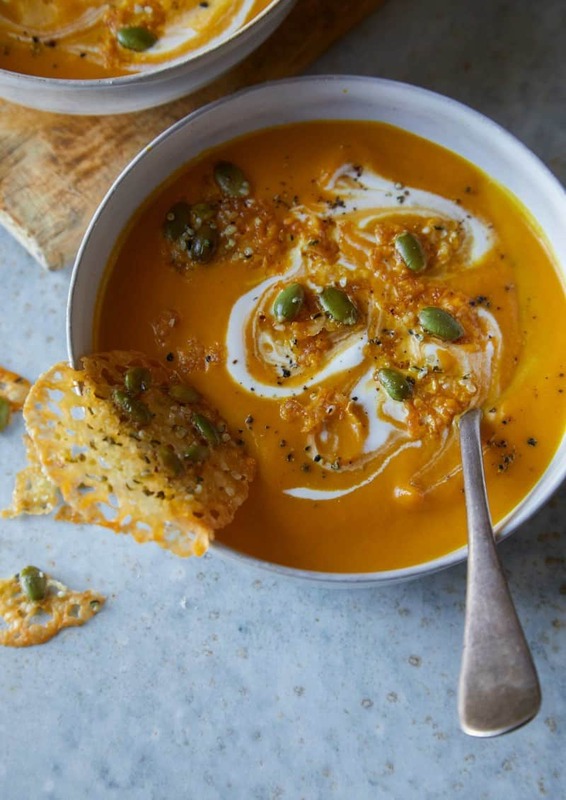 It’s super seasonal, cozy, comforting, and the seeded Parmesan Crisps take this soup to the next level, while still keeping things pretty quick and easy. 1. Parmesan crisps: Preheat oven to 350˚F. On a baking sheet, lined with parchment (or a silpat) divide Parmesan into 4 small piles, 3 inches apart (they will spread quite a bit). Top each pile with a sprinkle of pumpkin seeds, sunflower seeds and hemp hearts. 2. Place baking sheet in oven and bake for 3 to 5 minutes or until Parmesan has melted into discs and lightly browned. Remove from oven and set aside until completely cooled. 3. Place a large pot over medium heat and melt butter. Add shallots and garlic and saute for 4 to 5 minutes or until shallots cook down a bit and begin to caramelize. Season with salt and pepper. 4. Add herbs and spices and continue to saute for an additional 2 to 3 minutes. 5. Add 1 1/2 cups of stock and simmer. Once soup is simmering, stir in pumpkin puree and season with salt and pepper. 6. Transfer mixture to a blender (or use an immersion blender, and add stock 1/2 cup at a time, between blending) and with the motor running, add remaining stock until fully incorporated. 7. Pour soup back into the pot and simmer over medium-low heat until soup slightly thickens. Stir in cream (or half and half) and adjust seasonings. 8. Ladle soup into bowls, top with a dollop of crème fraiche and gently crumble Parmesan crisps over each bowl. Serve.